In his latest book Flagship: The Cruiser HMAS Australia II and the Pacific War on Japan, journalist and author Mike Carlton turns his attention to HMAS Australia II. He tells Cassie Mercer why the story needed to be told. IHM: What inspired you to start researching HMAS Australia II? Mike: I’d written two books of naval history, one on the cruiser HMAS Perth in World War II, and another on the great battle between the cruiser HMAS Sydney and the German raider Emden in World War I. They sold pleasingly well, so a third seemed like a good idea. The story of HMAS Australia and her sister ships Canberra and Shropshire was ripe for the telling. Thousands of Australians served in them, from the early Depression years to the very heart of the Pacific War at its most violent. IHM: Which resources did you find most helpful during your research? Mike: Survivors are always best. It’s such a privilege, and a delight, to talk to the men who were there, and their families. There are not many left now, but I was lucky to find some truly wonderful people keen for the story of their ships to be told. There is an extraordinary amount of stuff on the web these days, too. The ships’ logs, captains’ reports of proceedings, are all available. I had two favourites websites for this book: Trove, the National Library’s treasure house of nearly every newspaper published in Australia since 1788. And Ahoy — Mac’s Web Log, which is the blog of a great Australian sailor, the late Mac Gregory. IHM: What resources did you come across when researching your book that haven’t been widely used by others? Mike: There’s some wonderful stuff buried away in the US Navy’s Heritage and History Command. Reports of battles and the like. But you have to dig for it. IHM: Was there any information you uncovered that stopped you in your tracks? Mike: The gay stabbing murder on board HMAS Australia in 1942 was startling. And almost lost to history. Two stokers, Gordon and Elias, killed a third, Stoker Riley, shortly before the great battle of the Coral Sea. It was buried under censorship at the time, and almost forgotten later. The survivors never talked of it, for they felt it shamed the ship. It was not only a gruesome crime; it raised huge constitutional questions about our links with Britain. IHM: Which stories affected you the most while researching the cruiser’s history? Mike: The kamikaze attacks on these ships in 1944 and 1945. They must have been absolutely terrifying. HMAS Australia was hit time and again. IHM: Which personal stories amused you the most in the course of your research? Mike: There were quite a few, some of them entirely trivial. I really liked the one about the cook who went after an admiral’s wife with a meat cleaver after she criticised his food. IHM: If you could track down one thing you haven’t yet managed to find out, what would it be? Mike: I would like to know what happened to Gordon and Elias, the murderers. They went to jail in New South Wales for 12 years, then vanished without trace in the late 1950s. IHM: How did you go about bringing the history to life? Mike: I like to write history with the feel of a novel to it. The facts have to be all present and correct, but I hope to deliver them as a storyteller. In the end, it’s got to be an absorbing yarn. In this I’m inspired by such great novelists of the sea as Nicholas Monsarrat and Patrick O’Brian. 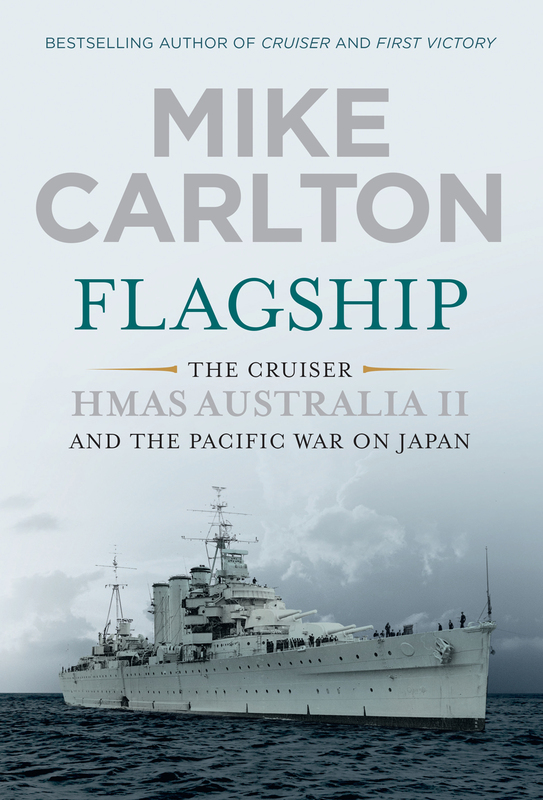 Flagship: The Cruiser HMAS Australia II and the Pacific War on Japan by Mike Carlton (Random House Australia, $49.99) is out now. For more stories from the Winter 2016 edition of Inside History magazine, click here.